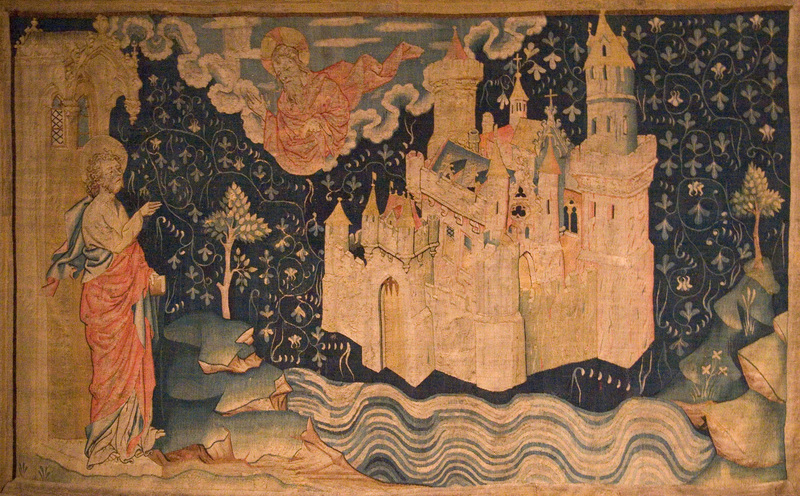 John of Patmos watches the descent of the New Jerusalem from God in a 14th-century tapestry. Now if we look at other Bible translations, we will see that in many cases instead of translating the Greek word “monē” to “mansions” other expressions are used. Many view the usage of the word “mansion” in John 14:2 as a literal “mansion” that one would physically dwell in. This “mansion” would be somewhere in the sky. But if one read’s further in John chapter 14 you will see that it’s the place or abode of the Holy Spirit. The Holy Spirit is taking up residence in each born-again believer. On the day of Pentecost God’s people became the new temple where the Holy Spirit would indwell and replace the old temple. What happened to the old temple? In 70 A.D. the Roman army under General Titus destroyed the temple in Jerusalem containing the dwelling place of God, the Ark of the Covenant. The Lord no longer needed or wanted a literal temple and the animal sacrifices that took place in that temple to continue. Now continue reading John chapter 14:3: “And if I go and prepare a place for you, I will come again, and receive you unto myself; that where I am, there ye may be also. And whither I go ye know, and the way ye know.” In John 14:8 Philip asks Jesus to “shew us the Father”. Jesus informs Philip that He (Jesus) is the Father. Then skipping down to verse John 14:15-16: “If ye love me, keep my commandments. And I will pray the Father, and he shall give you another Comforter, that he may abide with you for ever.” Notice the word “abide” in John 14:16. It comes from the same Greek root word menō used for the English word “mansion” in John 14:2. Again look at that word “dwelleth”. It comes from the same Greek root word “menō.” Jesus is telling his followers that He is the Comforter. As the “Spirit of truth,” Jesus Himself will come to them. John 14:26 further illuminates our understanding. It declares that The Comforter is the Holy Ghost! Jesus said that He would not leave them comfortless. That He (Jesus) would come to them. The Comforter is Jesus coming to His people in the form of the Holy Ghost (Holy Spirit). Just as Jesus declared in John 14:2 there are many “mansions”, “rooms”, “dwelling places” or many “resting places”. God no longer dwells in “temples made with hands” (Acts 7:48). Each believer that receives the baptism of the Holy Ghost becomes the “abode” or “dwelling place” of God. Our body is the temple of God. Yes, my friend we can have something much better than a “mansion” in the sky. Each born-again believer becomes the “dwelling place” of God. Now instead of God’s presence being inside the Ark of the Covenant, a literal temple, it indwells more than one temple. This temple would be inside each believer. His presence indwells each believer. We are the “abode” or “resting place” of the Holy Spirit. I guess I have to go change my decorating sheme now. LOL Thanks Ron for laboring at this forum. I have often thought about many of these topics and have even studyed them some. Clarity to the sriptures is like a peaceful journey of discovery. Thanks Vince! In my personal studies I have found it useful to use a number of translations in addition to a Greek/Hebrew concordance. Commentaries are also invaluable. It’s also vital to study a scripture in the overall context in which it was used. Thanks Roy! That’s been a very popular article. I HAVE ALWAYS THOUGHT THAT MANY MANSIONS MIGHT REFER TO REINCARNATION. THAT THE EARTH IS PURGATORY AND WE HAVE TO KEEP COMING BACK AS A LOWER LIFE FORM UNTIL WE MAKE THINGS RIGHT FOR OUR SINS. IF WE DON’T GET IT RIGHT EVENTUALLY WE GO TO HELL. THERE ARE ANGELS AND DEMONS HERE AND THE LATTER ARE WHY BAD THINGS HAPPEN TO GOOD PEOPLE. I BELIEVE MANSIONS ARE PROBABLY ALL OTHER CREATURES AND EACH ONE HAS THE SOUL OF A PERSON THAT HAS BEEN HERE BEFORE. Thanks for visiting our website, Larry. We appreciate that you took the time to comment on one of our articles. Our approach to scripture is to consider the context as well as the setting of the passage. We also dig into the Hebrew and Greek a bit to get the true meaning of words. The Bible is a spiritual book which must be spiritually discerned. Just as Jesus declared in John 14:2 there are many “mansions”, “rooms”, “dwelling places” or many “resting places”. God no longer dwells in “temples made with hands” (Acts 7:48). Each believer that receives the baptism of the Holy Ghost becomes the “abode” or “dwelling place” of God. Yes, we are the temple of the Holy Spirit; but since man is three-part – spirit, soul and body (see 1 Thessalonians 5:23), the Holy Spirit is actually living in our spirit. 1 Corinthians 6:17 says, But he who is joined to the Lord is one spirit. Thus, our spirit is a mingled spirit. Romans 8:9, 16 also indicate that the Spirit of God dwells in our spirit, not in our soul nor in our body (1 Corinthians 15:50). But since our spirit is in our soul and our soul is in our body, we can say that our body is the temple of God. This is liken to the physical temple of God which is comprised of the outer court, the Holy Place and the Holy of Holies but God only lives in the Holy of Holies. In order for the Lord to be with us always He needed to die and resurrect to become the Spirit so that He may enter into our spirit. 2 Timothy 4:22a says, The Lord be with your spirit.